Call them Hot Dogs, call them Franks, but Baseball is just not the same without them. This season we have added a new one to our line up in honor of our friend and Hall of Famer, Bob Uecker. This recipe was developed just for Bob. After hanging out in ballparks and eating hot dogs since the ‘50’s, nobody knows them better than Ueck. Mr. Baseball’s Famous Franks are made from only select cuts of beef, naturally smoked in our two story brick smokehouses and have a touch of garlic. You can grill ‘em or steam ‘em however you want to make them they always taste great ! 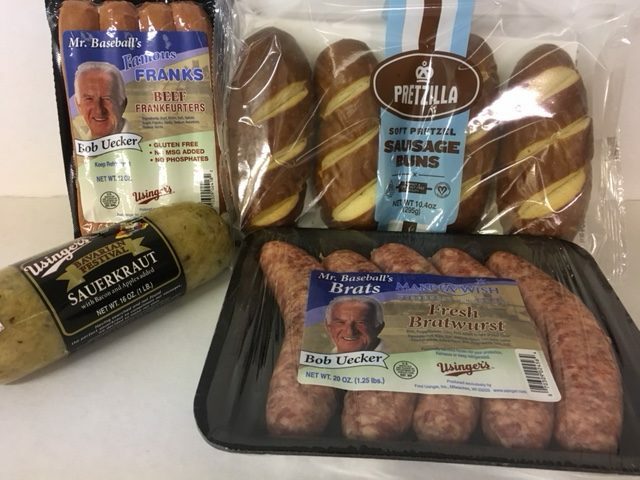 Look for Mr. Baseball’s Famous Franks and Mr. Baseball’s Fresh Bratwurst for your next cookout. You’ll find them at your local Sendik’s store. Next PostNext The Second Half of Summer!